This past sunny Sunday afternoon, nearly 100 people gathered in front of the Goodwin Memorial Baptist Church in Harrisburg. Some wore their Sunday best straight from church, some wore hijabs, some wore turbans, yarmulkes, or just plain street clothes—but all were dressed for the same occasion. September 16 marked Harrisburg’s fourth annual Harmony Walk to encourage and celebrate the unity between all faiths, especially amidst their diversity. 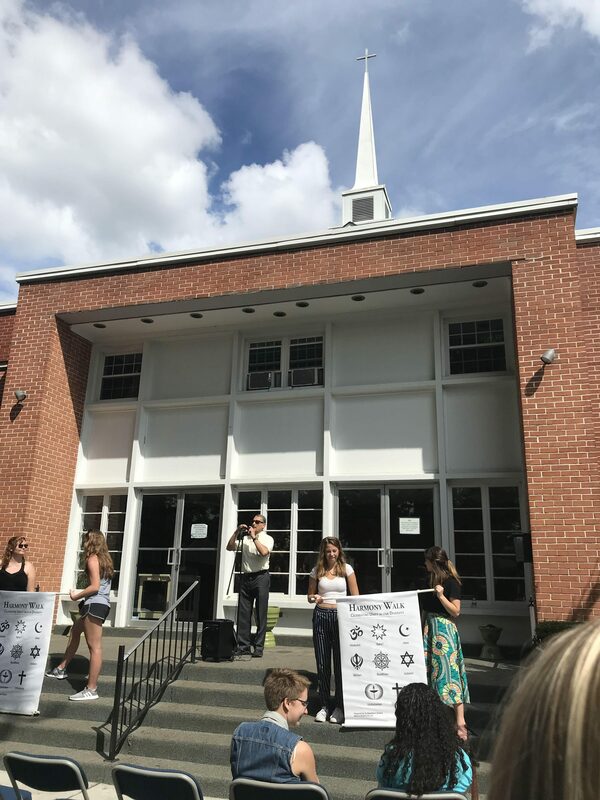 Participants had the opportunity to walk as a community between different houses of worship within the Harrisburg area, stopping at each building to hear messages of togetherness from respective religious leaders. Sponsored by the InterReligious Forum of Greater Harrisburg, this project was spearheaded by Reverend Cynthia Mara as an interfaith approach to celebrate the world’s religions. Although she could not be present at this year’s walk, her daughter, Heather Massey, delivered her mother’s opening address to the expectant crowd waiting on the church steps below. To Mara, each of the world’s religions, philosophies, and perspectives is like a single musical note: beautiful on its own, but a sound without much depth. But when all of those notes are combined, a “symphony of praise” is born and each ideology is weaved into a piece greater than itself. It is this idea of togetherness Mara wanted the Harmony Walk to capture, as people of different faiths came together to eradicate the fear of the unknown by willfully sharing in interpersonal understanding. Participants visit the Hadee Mosque. Harrisburg’s Harmony Walk is held in conjunction with the United Nations International Day of Peace, which is recognized around the world each year on September 21. The UN website explains, “the General Assembly has declared this as a day devoted to strengthening the ideals of peace, both within and among all nations and peoples.” The Harmony Walk is a tangible, local way of acknowledging this global ideal. 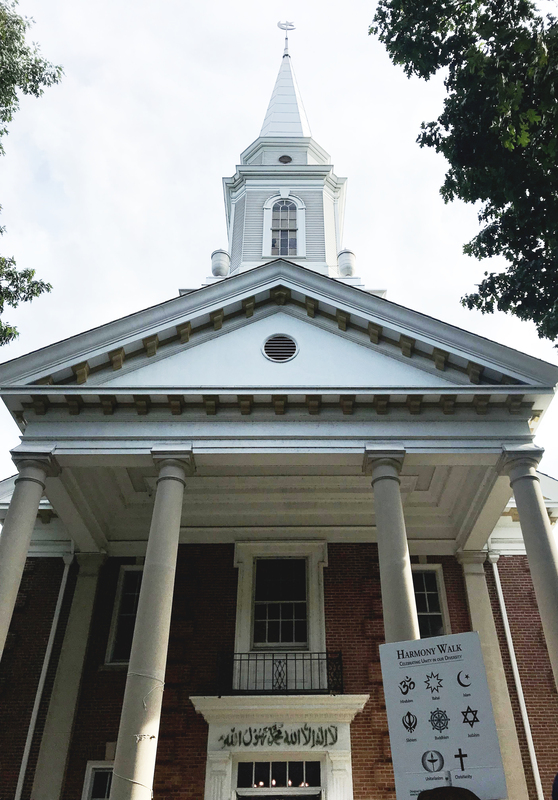 Walking the streets of Harrisburg, this community in unity proudly carried banners displaying symbols of faith: Hinduism, Baha’i, Islam, Sikhism, Buddhism, Judaism, Unitarianism, and Christianity. Though the group was small, the diversity of thought spanned much of the globe. As the march made its loop around the neighborhood, walkers were able to share their worldviews with one another, which led to a beautiful opening of hearts and minds. Bunny Hottenstein, a member of Harrisburg’s St. Paul’s Episcopal Church (also a stop on the Harmony Walk), expressed her exasperation with society’s closedmindedness and segregation of people groups. Those were the two words she continued to repeat throughout the walk: love and compassion, love and compassion. That’s why the Harmony Walk, in its underlying goal of unity, meant so much to her— “this kind of thing gives me hope,” she said. Students from Messiah display Harmony Walk signs. And as the Harmony Walk stepped onto the sacred ground of each of its represented religions, the leaders of faith echoed these sentiments of love and compassion among all people. From the Christian perspectives shared in the yards of the Goodwin Memorial Baptist, St. Paul’s Episcopal, and Wesley Union AME Zion Churches; to the Baha’i, Buddhist, and Sikh worldviews expressed on the steps of the Madeline L. Olewine Library; to the Jewish beliefs embodied beside the Kesher Israel Synagogue; to the Muslim ideals voiced at the Hadee Mosque—all faiths believed in the possibility of peaceful reconciliation between all humans. Although looking through different cultural lenses, each religious leader spoke of love, equality, and unity among people. And the diverse sea of onlookers provided an image of what this harmony could look like. As the walk came to an end in front of the Hadee Mosque, participants were invited to share a homecooked meal together provided by the Ahmadiyya Muslim Community. Inside the mosque, strangers entered an atmosphere of friendship as the Harmony Walk’s ideals culminated in good food and genuine conversation. This walk was just the beginning of an ideal toward which the Harrisburg community is working. But as the afternoon was spent walking over cracked sidewalks through neighborhoods of kids playing energetic games of basketball, the community experienced a glimpse of this interfaith friendship as they visited the places of worship that tie them all together.